Ireland head coach Joe Schmidt lamented the loss of Keith Earls after a bruising 32-20 loss to England on Saturday. 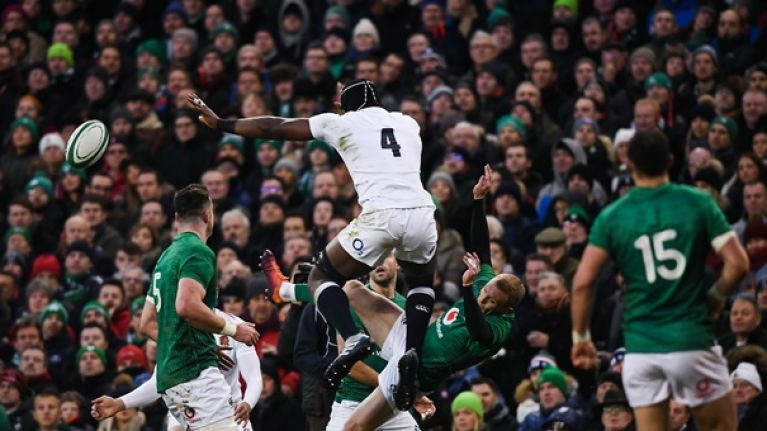 Earls was on the receiving end of some very heavy collisions with England flanker Tom Curry sin binned for a late hit on the Ireland winger in the first-half before he was clattered by second-row Maro Itoje a shortwhile later. Earls suffered a hip pointer injury and was replaced by Jordan Larmour at half-time and after the game Schmidt lamented the loss of one of his most experienced outside backs. "I think we were physically bettered," said Schmidt. "I don't think I've seen a game where our opponents got so many physical, dominant tackles. Where our opponents have carried physically in the manner that they did. "It wasn't a surprise to us, we knew that power that they bring to the game. To contain those guys is difficult. "Our ball was slow, it gives them an opportunity to take pot-shots and they took those shots well. "When that happens you're forced to go to the air because it's the only way you can progress and we couldn't really get into the aerial battle. There were a lot of white jerseys in front of any aerial contest. Maybe we were too honest there. They got great access to the aerial contest going the other way. "It got quite physical with Keith Earls. I don't think it was intentional, but it certainly put Keith out of the game and he was our most-experienced back three player in the game. "It was challenging to cover that space in behind and they played to it really well." Ireland enjoyed 60% of the possession during the game but England defended very well making 181 tackles at an 87% completion rate and Schmidt added that Eddie Jones' side were able to suffocate the hosts while noting that it's a reality check for his side after such a strong 2018. "Yeah, that is a reality check, that's how it's going to be," Schmidt added. "That's why England are such a, literally, a big team. They did really well tonight. it's hard to take anything away from England. The intensity they brought to the game, it was more a simmering physical intensity that they collectively delivered that made it a suffocating place to be out on the pitch."